Thursday November 16th 1893 It was a splendid day. Mother and Lee were here for dinner. Mother and I made calls in the afternoon and she stayed till after supper. Hattie came here for her to go to prayer meeting. I spent the evening at home reading. Friday November 17th 1893 It had turned cold again. I went up town in the forenoon to see about a hat. As soon as I got my dinner over I walked to the north end of town to see about some chickens. I sewed some after I came back then went up after my hat. Mr & Mrs Foster called in the evening but I still had time to go to the Opera house to the Karnival. I was tired when I got home. 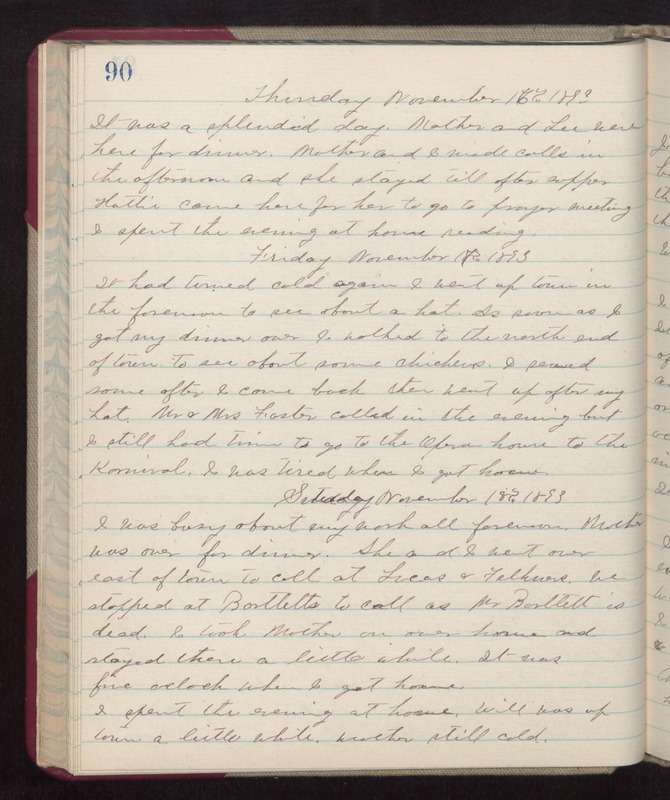 Saturday November 18th 1893 I was busy about my work all forenoon. Mother was over for dinner. She and I went over east of town to call at Lucas & Felkners. We stopped at Bartletts to call as Mr Bartlett is dead. I took Mother on over home and stayed there a little while. It was five oclock when I got home. I spent the evening at home. Will was up town a little while. weather still cold.